The victory dance exploded within the Adeleke family as soon as verdict of victory was declared at the tribunal sitting in Abuja that revisited the last Osun 2018 gubernatorial election. The Tribunal handed over victory to Senator Demola Adeleke the PDP Candidate. On hearing the news, Senator Demola Adeleke renewed one of his many fancy dance moves, while his nephew David Adeleke popularly known as Davido an acclaimed international music star, took to Twitter to congratulate his uncle, Senator Demola Adeleke over the victory announcement. Davido declared “IMOLE TI DE!!!!!!! CONGRATULATIONS TO THE GREAT PEOPLE OF OSUN STATE! 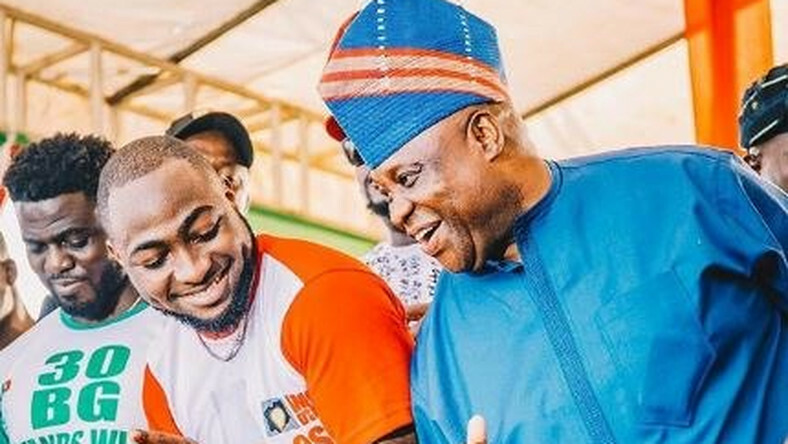 ” And the internet was suddenly saturated with pictures of Davido dancing with his Uncle Senator Adeleke. Of course a photograph that many do not know, dated back to the campaign period! Meanwhile, the incumbent Governor has taken a step towards an appeal of the Tribunal verdict. So it is a case of “not yet Uhuru” for Senator Demola Adeleke, as this means that the struggle continues. In another development, the state chapter of the All Progressives Congress, APC, has downplayed the effect of the verdict. Kunle Oyatomi the Director of Media and Publicity said the party rejects the election petition verdict.